Open and connect to Robot Monitor. 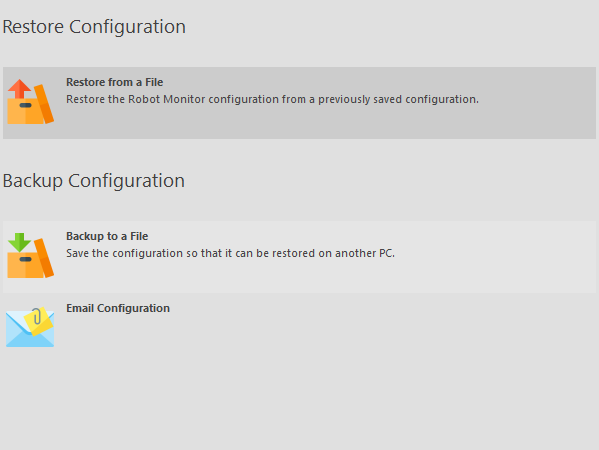 Select Backup/Restore Setting in the left-hand navigational pane. Click Backup to a File on the screen. Select the items you wish to save. All items are selected by default. Click the Save Configuration File button. The .msmconfig file is saved to the location you have specified. Click Restore from a File on the screen. Find or enter the location of the backed up .msmconfig file. Click the Load Configuration File button. Select the items you wish to restore. All items are selected by default. Click the Restore button. All selected items will be restored.